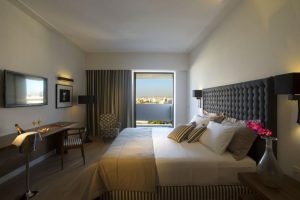 At Aquila Atlantis Hotel, your accommodation is exceptional. 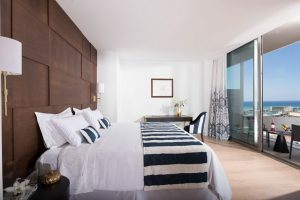 Our interior designers have combined their expertise in order to design and shape 158 rooms and 6 suites of unprecedented quality, relaxation and sea view. During our renovation in 2013 the utmost attention was paid to even the smallest of details, in order to ensure quality of the highest order through the use of fine materials, deep texture fabrics, and custom designs. 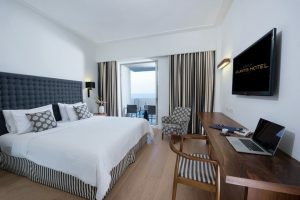 Our objective at Aquila Atlantis Hotel is to provide a harmonious balance between discreet luxury and comfort, while utilizing a unique and modern aesthetic. The main spaces are grand yet feel light and airy and are infused with beautiful artworks. 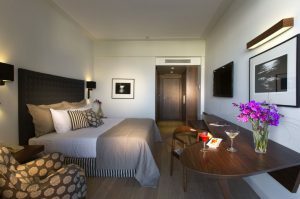 The rooms are exceptionally quiet for uninterrupted work and supreme relaxation, featuring generously sized desks and large comfortable beds. It is our priority to ensure that each moment you spend in Aquila Atlantis Hotel is an exceptional experience in modern luxury. 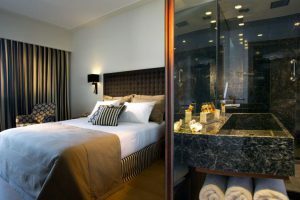 And it is our goal to satisfy even the most demanding customer, with rooms that surpass even the highest of standards.